Transcribed from "John Muir's Ascent of Mt. 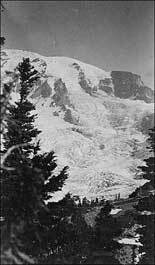 Rainier"
(As recorded by his photographer, A.C. Warner). (1956, December 28). The Mountaineer 50 (1), 38-45. Well it was this way. I was already to go to Alaska when a man came to me and said, "We want you to go to Mt. Ranier (sic) with us as special artist." At first I said I could not go as I had to go to Alaska but when they said I must go and that I would be well paid I said "All right" and on the morning of Aug. 8 at 3 o'clock my alarm went off. I turned over, rubbed my eyes and go up, I had everything ready and was soon on the way to the train. Mr. Ingraham went with me instead of going to Alaska. We had taken our traps down the night before and now we had only a few small things to take. At the train we met the rest of the party, Mr. John Muir, a well-known writer and explorer on the coast. It was he who wanted me. By the way he is getting up a book (1) somewhat like the Picturesque American that we have at home but will be far better and I am to have some work in it. He writes for the Century and Scribners. You remember an article on the wild sheep in the Century some time ago. He wrote that and is going to write one on the wild goat – one we ate, and I made a picture of his head – I mean the goat's. William Keith, an artist of Cal., S.W. Bass, Chas. Piper, N.O. Booth, H. Loomis, one of the compilers of the Loomis text books, used in the colleges east. B.S. Ingraham, and Yours Truly. We were all on time, save Booth who was late and got left. The train went to Tacoma, then south 20 mi. to Yelm, where we got off so we put up our tent, spent the day in making negatives, sketches, etc. Mr. Bass and myself slept in a barn that night on new hay, the others in the tent and around the old rail fence. There are only two houses there and so did not get beds. In the morning we got up, had breakfast, and as we were about to eat, a freight train came along and Mr. Booth jumped off. About 9:30 our pack train came along; it consisted of seven cayuses or Indian ponies. We went to work to get our packs on to them. The first one was loaded when all at once he gave a jump into the air and came down stiff legged, off came the pack, off went the cayuse. He was soon caught and we had it on his back again. About 11 o'clock we were to start. First in line was the man who took care of the cayooses, then a cuyoose (sic), than a man, then a cuyoose, then I was next and soon Mr. Van Trump, our guide met us at a point about 10 mi. from Yelm and that night we got to an Indian's ranch (2) supper, went to bed in a barn; up at 4:30, had something to eat, went on all day and camped at what is called Forked Creek. We left there the next morning at 8 o'clock; got to Succotash valley(3) at noon; where we got some potatoes and lived high. I found the farmer who lived way out there 20 mi. from any one else was a man who I knew in Omaha. That night we got to what are known as Longmire Springs(4) sulphur and soda. We had now about 20 mi. to go and on the following day we started. Now our hard work was over logs, stumps, cutting away trees, fording streams, climbing steep hills, etc. When we forded the Nisqually he fell into the river and was nearly swept away. The river is very rapid and great stones go rolling down. Here it was where I saw my first glacier and it was something grand. After crossing the river we had a very hard hill to climb and as Mr. Van Trump says "went almost skyward" from the river to the top of the hill was 900 feet at an angle of 65° and so we had to go zigzagging. Now we were nearly to where we were going to camp and it was a glad party that about 2 hours later reached the Camp of the Clouds, at an altitude of 6000 feet. As I got to the top of the hill, on which the camp was located,(6) I looked back and saw such a view as I had never seen before. Oh, if I had the power to describe it. At my feet was a bed of flowers such as I never thought could bloom, there were all colors and just below was an easy slope with scattering trees, not large or ragged, but about 50 to 100 ft. high and looked as if they had the best of care and were trimmed to easy, graceful shape they have; they seemed to be in avenues and not planted by the winds of the mountains. All was fresh, so new, so clean. The grass was short, fresh and green. There were not any old tin cans, newspapers, etc. I never saw a city park so clean and so nice as that. On the next plateau below we saw a small lake,(7) clear and still and throwing back a reflection of the trees and mountains beyond. On below was what is known as Paradise River; it runs through a valley of the same name and well is it named. Across this is a ridge not as high as the one I was on but just as nice. On beyond is a range of rugged mountains with the north slopes white with snow and not a tree or shrub. And just beyond as it seemed, are the great, white domes of Mt. Hood, Adams and St. Helens, though many miles away. Then turn to the west and look down to the valley that we just came out of with the Nisqually River winding away off in the foot hills. In the foreground is what is known as Goat Mountain(8) so steep and high, no one can reach its summit, though only 8000 ft. high. "Warner! Warner! Come and cook this ham!" broke the spell; with a sigh I came back to myself and found that ham was good and I must have some or I could not enjoy what I was to enjoy for the next week. After supper we lay around the fire and looked at the scene by moonlight. I thought of home and all of you; thought how nice it would be if you could see what I was seeing and enjoying. 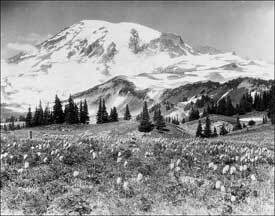 The next day we spent looking around, I with Mr. Muir looking at the glaciers and plants. At last, night came and we went to bed. Dan Bass and I made our bed out one side of the fire where we could see the Mt. way up over our heads, and in the morning the clouds rolled down from the Mt. and passed over us so we could not see 30 ft., then pass away and another would come. I can not tell how fine the great, white Mt. looked from this camp, but will say that not but a short distance from us the snow commenced and there were not any more flowers or trees. Our water came from a snow patch not 50 feet from our bed, then there was snow below us, but not where the sun got at it all the day. We were up 6000 ft. on this afternoon about 2 o'clock. August 13 we were all ready to start up to the top. We each took a blanket and a little hard tack in our knapsacks. I had my camera and had more, of course than any one else. We were to leave our blankets at the place where we camped that night; we did not start off until about 7:30; that night (day) we climbed over snow and ice, then we got to a place about 10,000 ft. where we were to stay over night. (9) The night was like a night in Minn. in Dec. There was a strong north east wind and our camp was not well sheltered. Dan and I dug a hole in the sand, then got some large flat stones or lava, piled them up so as to make a house; we used our Alpine staffs to form joists to lay stones on, so we had a very nice little house that we could sleep in and keep warm. Our work got us warm and when we went to bed we were warm and cozy, while the others rolled up in their blankets and were cold all night. We did not sleep much but talked most all night. About 4:30 in the morning we got up and started on, the others could not eat but I got away with two chucks of hard bread and a large piece of cheese. Now our work was about to commence, and we climbed over a ledge of rock until 10:30; the most dangerous part of the trip was over. Now we had nothing but snow to climb, so at a height of 12,000 ft. we put spikes into our shoes. You can read the paper and see how it looked on top or I will give a birdseye view of it. The craters are about 300 ft. deep,(13) and in the center are white with snow but on the edge there is a rim of lava rock and between this and the snow there was steam and smoke coming up, strong of sulphur. There had been snow within the last two or three days. If we put our hands down to the edge of the crater, they would get wet with steam and then hold them up in the wind and they would freeze a layer of ice on them. Every once in a while we would hear a roar like thunder and it would die away. It was the ice of the glaciers and the rocks falling from the high cliffs below. I made my negatives and nearly froze my arms for I had to take off my coat to focus with. I hardly know whether I had better try to describe the view but will say that for the first time I could see that the world was round, and I was up on a very high place. The air was very light. As on this higher peak I stood and looked away off toward home, I saw far off to the east, the rugged crags of the Rockies; and between were the valleys, and hills, lakes and rivers. Off into the Yakima Valley and where the Columbia River goes winding down toward the sea, then to the North with a long line of Cascade Mts. stretching off to the North, Mt. Baker 120 miles away with its snow clad summit, then a little to the west, and saw Puget Sound, Tacoma and Seattle and other little towns. Still a little further west and see the Olympic Range, and then due west and see the dull line where the Pacific lies. To the south west, Mt. St. Helens, Mt. Hood and Adams all white with snow, then back closer to the Mt. and see hills and Mts. green and white; and I asked "What is man that Thou are mindful of him and the son of man that Thou visitest him?" Down, down we went, till suddenly out of the awful silence there came a cry and we all stopped save one. He went on, on! Would he stop before he got to that awful crevasse? The seconds seemed like hours. We could do nothing, only wait until he reached it. Then with a quick move, he jumped over and threw himself full length onto the snow, sticking his pike-pole into it. (15) Such a cheer as went up I never heard. This was Van Trump, our guide and an old mountaineer. He had lost his spikes out of his shoes. Then he went on for half a mile. We had all crossed save two when another cry made the very blood in our veins turn cold. This time it was Piper. He stepped into the middle of the bridge and it had given way with him; he had thrown himself forward and caught. We pulled him up and he had lost his pike-pole so we had to let him down with a rope. The way we would do was this: we would go down a ways, then stick one of our pike poles up, take a half hitch around it, then let him take the end and start down; we had to go with the utmost care or we would slip. We reached the rock below about 3:30 and now we had another bad place. During the day the sun had melted the ice and snow on the top of the cliff, so it has loosened the rocks and they were falling every few minutes. (16) We had to go another way and along a very narrow ledge where above for 600 and 700 feet rose a wall of rock and down below for 1500 ft. and at its base the broad Glacier; this ledge was not over 2 feet wide in some places and covered with loose rolling stones. One with a giddy head could not have gone there, or if he had, he would not get out alive. At last we were down the worst of it and we would get at the top of a slope covered with snow and standing on our feet and balancing with our pike poles, would slide. I had one that beat all the toboggan slides I ever took; it was most a mile. At last we reached the Camp of the Clouds where they had hot coffee ready for us. The next morning when we got up I had sore lips. Dan had sore eyes, others all over their faces. Dan Bass was sick in bed for two days and blind for three but is all well now. My lips are most well. The next day some of the party went home by another route,(17) leaving only Muir, Keith, Bass, Loomis and myself. We went to another camp about 2000 ft. lower down where it would be warmer. Mr. Muir went and set stakes to see how fast the glacier was moving and found that it went at the rate of 12 inches in 22 hours. On Thursday morning Dan was well enough to go home and he started off alone. We remained until Saturday, when we made up our minds to go to the soda springs (Longmire) just at the base of the mountain, I got there about 4:30 and had the boy get the horses when for the first time in my life I packed the train and got under way. Mr. Muir and Keith said I would do. All went well until we got to the river where we had to ford. Here we had some bother and one of the horses went down and I thought he would be drowned but he got on his feet after a time and came out all right. Then another little one that we call Squeball tried it, and got his back wet. There was not so much that we had, but we had all that the others had as they only took enough to eat and a blanket each. We reached the springs about 4:30. The next day was Sunday and we lay around and talked. We were to start on Monday but when we were ready to get the horses, they were gone! We tracked them and two of them had forded the river and gone back to the Camp of the Clouds, so we didn't get off until Tuesday at 8:30. We had gone about 1/2 mile when both packs slipped and I had to take them off. We rode all the other horses, and about 4:30 in the afternoon we got to Succotush (sic) Valley where Mrs. Cranahan (Kernahan), the only white woman in 30 miles, got us a good meal, and we slept in the barn that night; got off at 8:30 a.m. and had ridden 23-1/2 miles to Indian Henry's where we stayed over night. At 4 a.m., got up and got breakfast. This is what we had, one dozen stolen eggs, boiled (but we paid for them when the Indian got up), fried ham, boiled new potatoes, stewed peaches, rice, hard tack and coffee. When breakfast was ready I called the rest and we got on the way about 7:30 and crossed the Misshell (sic) river and over the Misshell Mt. (18) at about 9:30 and at 2:30 came in sight of Yelm, and at 3:30 we got to Van Trump's house where we had a fine dinner for us, the first good meal we had eaten for two weeks. At 5:25 the train came and we were on our way to Tacoma. On the train a reporter got after me and wanted the trip. I gave it to him as best I could. Chas. Keller, of St. Paul was on the train. When we got to Tacoma of course something had to go wrong and the train men left our truck at the wrong depot and I had to stay over. I was a sight, but didn't care for that, with high-water pants on, a small grip in my hand and my long pike-pole. I went up to the hotel and the first men who knew me were Mr. Grigg and Will Rice. I had most 4 weeks beard on my face and an old brown hat that the rim was most torn off. I got washed and shaved and then told my story to an eager crowd who had read our account in the papers I send. Left for home at 11 on the following day and am all o.k. Negatives came out fine and will make a good thing of it. "Picturesque California, the Rocky Mountains and the Pacific Slope," edited by John Muir. New York, J. Dewing Pub. Co., c. 1888. 10 volumes. Indian Henry, who had adopted white ways and developed a good farm on the Mashell Prairie. 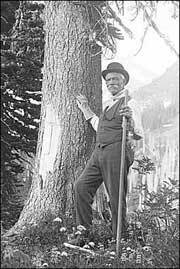 Muir described him as "…a mild-looking, smallish man with three wives, three fields, and horses, oats, what and vegetables…"
Succotash Valley took its name from the Indian word "So-ho-tash," the place of the wild raspberry. 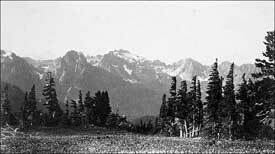 It included the Nisqually River Valley from present Ashford nearly to the park boundary and had for its only resident James B. Kernahan, who settled on his "Pallisade Ranch" in 1886. The Springs were discovered by James Longmire, P.B. 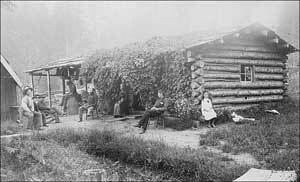 Van Trump, and George Bayley in 1883; the following summer Longmire returned with his wife to build a small cabin near the Soda Spring. He later claimed the entire meadow under the mineral laws. The large "view camera" used sensitized glass plates which were very fragile. 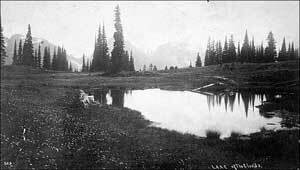 Joseph Stampfler tells of a humorous episode which occurred on the switch-back trail above the Nisqually Glacier. Yellow jackets attacked a horses loaded with photographic and camp equipment; he bucked and kitchen tinware went flying. The original Camp-of-the-Clouds was on the east shoulder of the little hill now known as Alta Vista. Later a tent camp by the same name was established on a ridge south of the hill. Obliterated in the construction of the present road and parking area at Paradise. Now called Mount Wow, from a corruption of the Yakima Indian word "wow," applied to both sheep and goats. The present Camp Muir. The site was selected because Muir recognized, in the presence of light pumice on the ground, a spot comparatively free from wind. A stone public shelter built in 1921 has taken the place of the crude windbreaks such as Warner describes. Altitude sickness results from poor physical condition or lack of acclimatization. The symptoms are headache, nausea, vomiting, lack of appetite, insomnia and irritability. The place now known as " Camp Comfort" from the name given it by Major Ingraham on a subsequent ascent. Van Trump says: "I was much pleased by Muir's kindly sympathy for the lad, and with his cheering and encouraging words as he urged the wearied climber to push on to the goal, he meanwhile waiting for him." If the total depth of the crater cone is meant, that is a good estimate. However, the surface of the contained snow is seldom more than 50 feet below the rim of the crater. 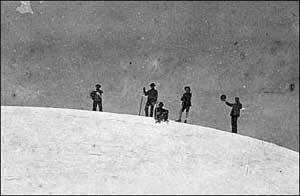 Van Trump wanted to go on to the unconquered north peak (Liberty Cap) but he bowed to John Muir's opinion of the weather situation. This event occurred after Piper broke through the snow bridge, rather than before it. Van Trump was the last man to leave the summit and loss of the bridge over the crevassed forced him to vault over deliberately. Piper's version of his narrow escape was later published in THE MOUNTAINEER, Vol. 8: 52-3 (1915). Rockfall from the cliffs overhanging the Gibraltar ledge continues to be the bete noire of climbers using that route. The thawing action of the sun loosens rocks from the size of pebbles to boulders weighing many tons, creating a bombardment which is truly terrifying and lasts through the hour s of sunlight. Prudent climbers do not cross the "ledge" during the periods of rockfall. 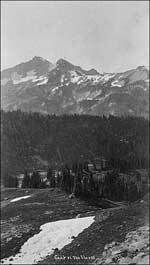 Major Ingraham, Piper and Booth traveled around the east flank of the mountain, over the Cowlitz, Ingraham and Emmons glaciers, and then passed down the White River Valley to Enumclaw and Seattle. Both the Mashell Mountain and Mashell River were crossed the previous day, prior to reaching Indian Henry's.